Aviation Updates Philippines - Despite the unbearable heat in NAIA, the airport's general manager Jose Angel Honrado said that the opening of Terminal 3 for international flights will help congest flights in Terminal 1. Five international carriers will also transfer flights to Terminal 3 from Terminal 1 starting August. According to NAIA general manager Jose Angel Honrado, "The opening of Terminal 3 is part of the alternative program being implemented in the civil aviation industry," he told reporters through the Kapihan sa Diamond Hotel media forum held in Manila weekly. Honrado said that installation of closed circuit television cameras (CCTV) together with several projects, are expected to be completed by July to improve passenger and safety experience when travelling through the airport. Unbearable heat in NAIA is experience by passengers due to lack of air-conditioners inside the airport. Until the new air-conditioning units arrive in August, passengers and airport employees will just have to suffer the heat that is boiling around 37 degrees Celsius. No wonder why NAIA was listed among the World’s Top 10 Worst Airports according to Wall St. Cheat Sheet. NAIA Terminal 1 slightly showed an improvement after NAIA was placed under Top 8 followed by an airport in Nairobi, Kenya at Top 9 which was considered as hot, ugly, dirty and confusing. Honrado admitted that the terminal's capacity is now saturated and this had proved that there is no need to construct another gateway for Manila. He also blamed regional airports which can only accommodate daytime flights due to lack of night travel capability as the main reason why NAIA is congested during daytime. He cited that Caticlan Airport, which is the main gateway to Boracay, doesn't accept night flights forcing passengers to stay overnight in Manila before boarding the plane bound for Caticlan. However, Kalibo International Airport, which is 71.7 kilometers away, is another gateway to Boracay that accommodates flights anytime. Meanwhile, the current rehabilitation at the Ninoy Aquino International Airport Terminal 1, which costs 1.3 billion, is only limited for the passenger terminal. "The well-wishers area would be subjected to open bidding, and there’s no bidding going on yet," Honrado said. The well-wishers area is where relatives meet and send off their loved ones. It will be developed once the NAIA Terminal 1 rehabilitation is completed. The design of NAIA is based from the concept design by Kenneth Cobonpue, Budji Layug and Royal Pineda. The 1.3 billion rehabilitation project will include the centerpiece of the project. The design of the trio said that the current parking lot will be demolished, and in its place would raise an open-air arena, surrounded with palm trees and eateries. Originally, the trio's estimate for the full package was P500 million to renovate the interiors of NAIA including the departure and arrival area. Another P500 million will be spent for the construction of an outdoor arrival extension, including a park, restaurants and shops, and a three-story parking garage. Honrado said that the Aquino Administration's plan is to develop NAIA and Clark International Airport to improve air traffic capacity while NAIA is still in process of rehabilitation. Honrado added that Clark has 2,300 hectares of open space, good for two or more runways compared to the NAIA with 420 hectares. 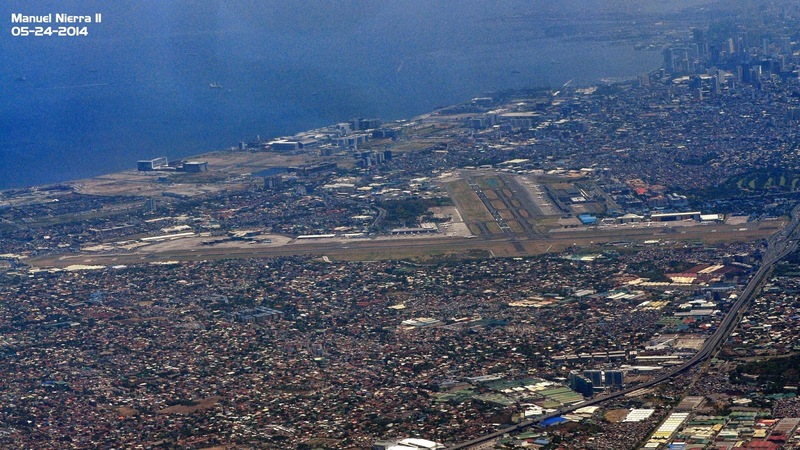 While MIAA general manager compared Clark Airport to Tokyo Narita Airport, Chep Lap Kok Airport in Hong Kong and Kuala Lumpur International Airport, he found out that all of these airports are almost the same distance as Manila is from Clark, but it is served by high-speed trains and a skyway for vehicles. An adoption of a new air traffic management will be acquired a few years from now. This will allow to increase air traffic flow at NAIA which only operates 40 take-offs and landings per hour, but when this is added, NAIA can operate 50 take-offs and landing per hour. The 10 billion airport project of Philippine Airlines and the San Miguel Corporation is still under study. It will be built in a reclaimed area of Manila Bay. But, this will take years to be built. The proposed airport will have four runways which can accommodate regular Airbus A380 flights. It can also accommodate 250 take-offs and landings per hour or about 6,000 take-offs and landings a day, which is very far from NAIA's 40 take-offs and landings per hour. Ramon Ang estimated that the airport can handle 75 million passengers a year. The construction of the airport is open to all who wished to be partners with SMC; even Cebu Pacific can construct a low cost terminal within the vicinity of the planned airport of Ang.